Interiors and architectural photographer; product photographer; branding and marketing specialist based in Charlotte, North Carolina. It is the moment you have been waiting for... A beautiful listing created to market your home. But wait. Creating great marketing takes time too! Once your deliverables are done, we will email you a gallery or some links. If you did not want a still virtual tour and only photos, we have sized them to what you needed in Google Docs or an electronic transfer via WeTransfer. Check the "All MLS" and/or "All print-quality" option and download. 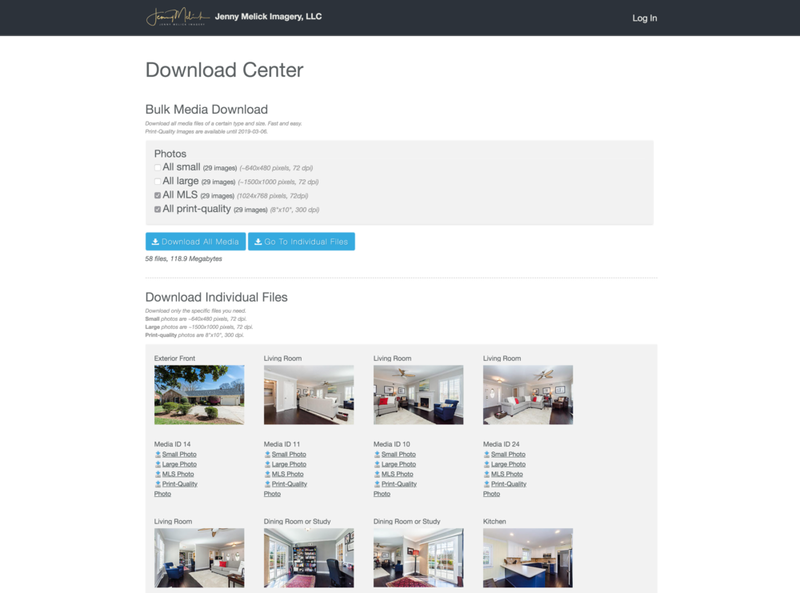 The MLS sized photos are for MLS use while the print-quality images are great for your printed marketing materials and brochures to sell the MLS listing. Just another reminder, photos are not transferrable and is one-time MLS use until the closing of a home by the client and client only (as well as the client's assistants and any marketing professionals hired to handle the marketing of this MLS listing). The photos cannot be passed on to the homeowner, realtor, stager, and other third-party vendors unless they are the client who has signed the agreement and paid for the photos. If anyone else would like access to the photos must contact us. We appreciate you understanding of these photography industry standards that keep us in business. We hope this is very straight-forward and simple to follow. If you have any more questions or concerns, please don't hesitate to contact us.